When you’re moving into a new home, office, or apartment, you want a moving company that you can rely on. That’s why you need to call the moving professionals at Wildcat Movers Carrollton. We provide a moving service that is convenient, fast, and budget friendly. We know how valuable your furniture and belongings are to you, and that’s why will treat your valuables as if they were our own. 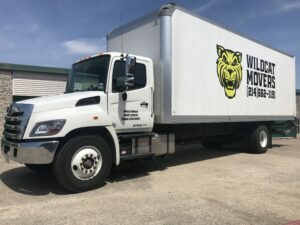 When you call Wildcat Movers Carrollton for your next move, you can rest assured that you have made the right decision by choosing a moving service that’s insured and registered with the TXDMV. In addition, we always use contracts and are very well reviewed. We are Carrollton local movers located just blocks away close to the intersection of Midway and Belt Line. When looking for a full service moving company that can handle all your packers and movers Carrollton needs look no further than Wildcat Movers. We will survey your home, office, or apartment and design a moving plan based on safety and efficiency. If you are in need of an Carrollton apartment moving company that is dependable to move your home, office, or apartment for a price that you can afford, then call the moving experts at Wildcat Movers. Our professionals will handle your valuables with care, and our service always comes with a 100% customer satisfaction guarantee. Call Wildcat Movers today for a free moving quote. Wildcat Movers Carrollton understands that moving can be extremely stressful and taxing, and we are here to take the stress out of moving. With a team of experienced and professional movers, our goal is to make sure you move is hassle free and without incident.